Vincent is a licensed attorney, professional photographer, musician, and an authority on intellectual property law such as copyright, trademark, and rights of publicity, privacy, and trade secrets. Vincent is able to mix his background and experience in the fields of law, art, and entertainment to counsel and advise creative people and organizations in matters regarding trademark registration; copyright recapture, terminations and restoration; and royalty claims. Vincent writes, rants, consults, speaks, educates and entertains on subjects related to intellectual property law and business, as well as photography and imaging. Vincent helps you protect your ©opyrights and B®ands. the law offices of Vincent Kostiw, Ltd. The firm was founded in 2004 by Vincent J. Kostiw with a goal of utilizing technology to provide efficient delivery of legal services, breaking away from the traditional, outdated law firm model. Federal Trademark Registrations, Repair of Trademark Applications, Respond to USPTO Office Actions, Copyright Recapture Claims, Royalty Claims. Art Law, Business Law, Entertainment Law, Film Law, Intellectual Property Law, Music Law, Photography Law, Television Law. Patent applications; shop bands, artists or screenplays; work on speculation or contingency; litigation; criminal law; family law; write nasty letters or threaten people; practice law like it's still 1975; behave like a junk yard dog; or waste your time. Read article excerpts from Vincent's Blog below. What is a Trademark and How Do I Register a Trademark in the US? A trademark is a word, phrase, symbol, logo or design, or a combination of words, phrases, symbols, logos or designs, that identifies and distinguishes the source of the goods of one party from those of others. 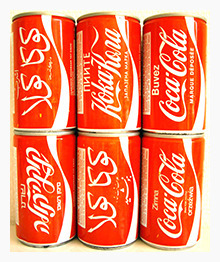 An example is the six Coca-Cola cans on the left all in different languages, but easily recognizable as the product Coca-Cola. Why? The red can, the white ribbon, the styling of the wording, all registered trademarks that serve to identify the brand and product source. A service mark is the same as a trademark, except that it identifies and distinguishes the source of a service rather than a product, such as “When it absolutely, positively, has to be there overnight” identifying brand and source of overnight delivery services by FedEx. The terms “trademark” and “mark” are often used interchangeably to refer to both trademarks and servicemarks. 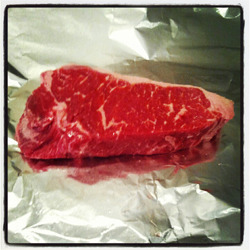 What is a Vegas Strip Steak? Another example why intellectual property is valuable and important to protect. Recently a meat specialist at Oklahoma State University rendered a 14 ounce cut of beef similar to a New York strip steak (only better according to the creator), from an area of a cow usually reserved for measly hamburger. All content © (various years), Vincent J. Kostiw, unless otherwise noted or claimed by a third party, All Rights Reserved. Linking to and reposting content for informational or educational purposes is encouraged, but commercial use of any content contained herein without an express license is prohibited.